A smart, personalized shopping experience from app to aisle. 365 approached Gin Lane in the Spring of 2015 with a vision to create a new kind of grocery store; one that intelligently leverages technology to challenge and fundamentally change the way that it’s customers shop for groceries. I led a team 3 designers, 6 developers, and Gin Lane's leadership team from strategic discovery through interaction design, technical implementation, and final delivery across 5 launches, extending from July of 2015 through August of 2016. I created frameworks and user narratives to convey the vision of the platform to 365’s leadership and supporting board of investors. I created user journeys, content strategies, wireframes, motion prototypes and design specs to support Gin Lane’s interactive designers through a 2-month intensive of design/development sprints. I lead the design of 365's modular system of data and content elements that underpin the structure of the pages and the data that feeds them. As the product and team spun up, I also lead the implementation of that strategy (a lot of late-night data entry). I partnered with a Gin Lane & 365’s leaders to uncover insights and experiential opportunities across the shopping journey. I defined and prioritized features through technical requirements and user stories to create a shared understanding of product scope, including data needs and integration dependencies from external systems of record. I acted as the primary point of contact between 365, Gin Lane, and Whole Foods’ technical implementation partners. I also managed the day-to-day workload of the Gin Lane’s strategy, design, and development resources. At the start, the 365 team was small, but fierce. Built entirely of top-performing leaders from the Whole Foods organization, they had few illusions about the task ahead of them. Their vision was to create a new kind of grocery store, one that fundamentally re-approached what a grocery store is. To me, that was unbelievably exciting, something I'd been hoping for since I'd joined Gin Lane nearly four years prior. I had the chance to help design a physical-and-digital retail experience, together, from the ground-up. Of course, to build that future-facing experience, I'd need to more fully understand what the world of grocery shopping looked like today. As a young, urban, and (at the time) single twenty-something, I knew that my own view of the grocery shopping experienced was limited. I sought to broaden it. With the support of my strategy-partner-in-crime and customer-insights-guru Lily Burtis (shout out! ), we interviewed dozens of customers, workshopped with leadership, operations, and technology stakeholders, and visited a heck of a lot of grocery stores. From the high-end to the low, every grocery store we visited paid at least some lip service to the "Organic" and "Sustainable" foods that had once been Whole Foods' exclusive domain. In the face of that competition, Whole Foods doubled down on its experience, hiring the best pizza-baking, cheese-mongering, personal-shopping experts in town, in every store. The customers we met had heard the memes. "The Whole Paycheck" and "Asparagus Water" weren't helping the percetion that Whole Foods was just too expensive to fit their needs. Touring with regional buyers, we learned that not all "organic" foods are created equal. From boxes to meat countertops, the vigorous vetting and certification processes made our heads spin. With every grocery store I visited, I couldn't help but notice how similar the underlying experience was. I sought some historical perspective; where did the modern grocery model come from, how had it changed over time, and why? In an on-demand and personalized world, our grocery stores still treat us like warehouse workers. The modern grocery shopping experience was pioneered in 1916 by a shop called Piggly Wiggly. Built like an open warehouse, its aisles let customers to explore and shop at their own pace for the first time, dazzled by a seemingly infinite array of choices. 100 years later, our grocery stores are exactly the same, while the world (and our expectation as consumers) has changed completely. From fast-casual burgers and salads, to perfectly proportioned meal kits from Blue Apron, we expect more quality and convenience from our foods than ever before. During our Netflix binges, scrolls through social feeds, and shopping sprees, our services learn our tastes and tailor themselves accordingly. Empower a deeply contextual and personalized shopping journey, from app to aisle. Whole Foods had doubled down on investing expertise in the experiential elements of its stores, employing best-in-class cheese-mongers, butchers, and personal shoppers to guide customers to the products that fit their priorities. On the flip side, 365 was intended to be a simpler, more streamlined experience, pared back to fewer options, with fewer employees, at lower prices. The opportunity for 365 was to establish a digital expertise; to accomplish "intimacy at scale" by tailoring each shopping experience to guide customers to the products that fit their lives; encouraging smarter shopping, better eating, and healthier living. Helpful tools for customers, personalized service for members. To ground that high-level vision, I created a visual service loop that illustrated key features to engage our customers, help them shop, learn from their actions, and increasingly tailor itself accordingly. With illustrated user stories and a high-level flow of data to support them, I proposed four "families" of tactical features; for everyone, and for rewards members. 365's digital experience would need to provide broad and deeply transparent access to the complete selection of products (and the tools to find, filter, and compare them). It would illuminate possibilities for those products through contextual content like recipes, dietary guides, and other editorial features. Tools to plan smarter shopping lists with purpose, capturing and guiding toward the needs, tastes, and goals that inform their purchases. The experience could guide customers toward their potential by serving exclusive/tailored offers, product and content suggestions, and actionable advice. The only question left was where to begin. As a first step, I suggested to build a single, cohesive digital experience that could live across screens, contexts, and locations. To start, we'd create a responsive web-application, supported by a host of smart integrations, that would serve as the foundation for future implementations like digital signage, in-store kiosks, and native apps. The high-wire act: a gauntlet of dependencies on a tight timeline. 365 planned to open its first store in Silver Lake in May, and the brands’ publicly stated emphasis on digital innovation created high expectations for the platform and little wiggle room for the project. From the kickoff of design and development in January, I managed a high-wire balancing act of simultaneous user experience design, visual system definition, and foundational back-end development with a high level of dependency on the external development of APIs to feed the platform. This included weekly communications with a handful of external teams, writing technical specifications for data responses, testing tolerances of that data against UI design, and adapting my team's workflow to placeholder data to keep our intensive pace of development. A "simplified" view of dependencies at the start of the project. 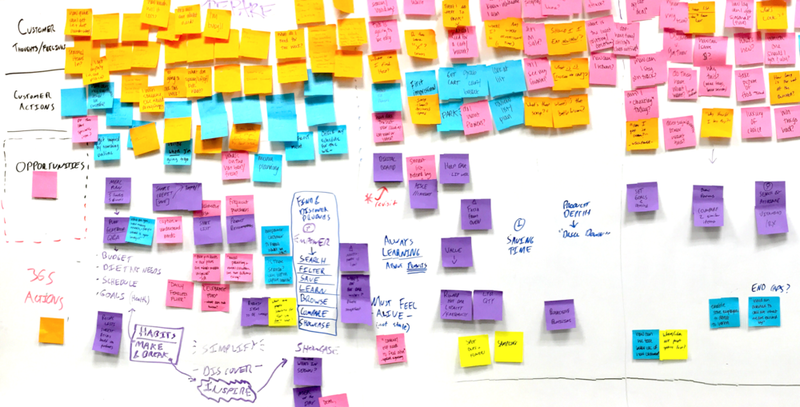 Balancing simultaneous iA, UX, and systems design. Next, we'd need to sculpt our product vision and platform constraints into a cohesive user experience. To keep the developers moving on both sides of the divide, I had to turn high-level vision into low-level requirements quickly. Over two months, I worked in two-week sprints to stay just ahead of interaction design and development, crafting user personas and product scenarios that would illuminate API requirements and back-end system needs. I also created an information architecture and content blueprint that would give Gin Lane's interaction designers and front-end developers an understanding of the breadth and depth of the platform's interface and content requirements. Navigation for the most powerful product data ever. Whole Foods had never made its product data available to customers before. The company had grown regionally, and the technology to manage sales and inventory data had always been chosen by local leaders. 365 had a chance to change all of that, but it wasn't going to be easy. Powered by The Sage Project, 365’s product "ingestion" process was designed to provide broad and deep access to a panoply of powerful data-points from various sources; from the prices and promotions for each product, the categories and dietary considerations that group them together, sourcing information (farms and distributers), the authoritative bodies that certify them, all the way down to the granular nutrition facts from the label or package of each product. To provide users with intuitive ways to browse, find, and learn about the products that fit their needs, we’d need to craft a complex taxonomy of product attributes for the business to power a simple experience for the user. I worked closely with 365’s leadership, buyers, and the data ingestion team to create a comprehensive attribute taxonomy and categorical topology, and to design a system that would give the team the administrative tools to to re-map attributes, re-organize categories, and re-configure the organization of products at will. This approach would allow our alphabet-soup systems of record (POS, ERP, CRM, ETC) to operate independently, while granting the 365 team complete control over how the data is displayed on the digital experience. Users can browse across the departments and aisles that mirror the store’s layout, as well as broader lifestyle focuses that support the needs of their health, diet, or family. A vast array of filters let users find products based on dozens of concerns, from authoritative certifications, nutritional needs, and environmental concerns such as recyclable packaging. In the wake of "whole paycheck" and asparagus-water-gate, we all agreed that it was important for 365 to be transparent about its pricing strategy. The 365 digital experience allows its users to set their store to display its featured promotions as well as each product’s pricing and availability in real time. 365 prides itself on only carrying products that are good. I proposed that each product's detail page ask the question; how good is it? Digital-first content; ready for broadcast, tailored to you. Like each of member of its’ lean team, 365’s digital-first approach to marketing communications meant that the editorial components of the website would need to wear a lot of hats. The marketing team needed the ability to create a wide breadth of content; articles, recipes, how-to videos, campaign promos, and the collections that mix them all together. A lego-block "page builder" system of components for all occasions. To provide the team with simple-to-use tools, I worked with front-end development and visual design to create re-arrangeable content modules, across a dozen pre-configured templates make it simple to spin up a new article, recipe, or collection. The content pages are underpinned by the same taxonomy as the product experience so that, in the future, 365 will be able to surface editorial content that is personally relevant to each and every customer, providing the layer of contextual guidance that is crucial to the strategy. Digital deals & personalized perks. my365 Rewards is the “front door” of the membership experience for the 365 digital platform, enticing customers to join with perks like digital punch cards, and 10% off of dozens of products each week. I worked with Whole Foods' data governance team to develop a system of user shopping attributes, enabling the program to learn from customers' shopping habits over time and present increasingly tailored and personalized perks that can be redeemed with a quick scan of the member's digital membership card. Once they’re in, the platform begins to create personal value for each customer by placing them at the center of the digital experience. An interactive and conversational onboarding flow learns the needs of individuals and their families; their diet, allergies, tastes, and values. It invites users to set lifestyle-oriented goals around health and fitness, diet, and sustainability. For each, customers can tweak exactly what those goals mean to them - seeking or avoiding specific ingredients, production processes, and certifications. From the expansive product catalogue, the 365 platform surfaces products that fit into customers’ lives. Through the membership program, it surprises and delights with personalized offers that are focused on those needs and goals. It also utilizes that growing understanding to surface relevant content, such as recipes that can be made with the products they’ve purchased. A schedule of cascading feature releases. The first release of the 365bywfm.com digital experience launched just ahead of the first store opening in Silver Lake, CA in late May of 2015. With a focus on the rewards program and sales pages, nearly all of the site's most complex product-centric features were ready for action. Throughout June and July, I managed four additional launches to release the remainder of the platform's features, iteratively deploying entire new sections of the site. Quickly following a business-controlled Sales page, we rolled in the complete product catalogue as thousands of products were "ingested" into the system each week. "Basket sizes were larger, the store attracted a larger demographic base, and it drew many more customers than expected. " In that first weekend alone, thousands of members joined the site and redeemed hundreds of offers, and many more would follow in the months to come. When 365 opened its second store in Bellevue, WA, in July. Like in Silver Lake, turnouts were higher and baskets larger than expected. Whole Foods had a genuine hit on their hands, and the stock price jumped accordingly, rising considerably over two months. Unlike the regular stores, the 365 stores offer a rewards program. And there are lots of other little perks for budget-minded shoppers: You can look up virtually any item in inventory on their site to get the pricing, so you can ballpark the budget for your list before heading to the store. The prices are lower for everything! Join the rewards online @ 365bywfm.com and get deals when you shop & digital coupons. This grocery store really lives up to all the hype!